How the hell does one decide whether a fundamentally genderless object is masculine or feminine (or a different class altogether)? When it comes to food, I am a man of simple tastes: pretty much any salty carb will satisfy, especially if there’s some melty cheese involved. And few salty, carb-laden, cheesy delights are as satisfying as an appetizer — though it’s far more filling than that — served at Little Dom’s, a standby Italian restaurant in L.A.’s Los Feliz neighborhood. It’s not a dish you can expect to get at every Italian joint, either, which makes it all the more special. Even Scarlett Johansson has been spotted eating this food, I hear. The delicacy appears on the menu as “rice balls,” and that’s what they are: balls of cheese and rice cooked to a crisp on the outside, gooey on the inside, dusted with herbs and Parmesan. A side of marinara for dipping completes the experience. But back in Sicily, where the rice ball originated, a long-running debate has tainted the glory of this perfect snack: As BBC travel reporter Stefania D’Ignoti writes, it’s a matter of language: “While those living on the eastern side of the island use the masculine name of arancino (arancini when plural), residents of the western side advocate for the feminine form, arancina (arancine when plural)” in referring to these savory treats. The split traces back centuries. The name “arancino” developed through the rice ball’s resemblance to a sour orange, or arànciu, imported by Arabs in the middle ages. But by the 1400s, the Portuguese were importing laranja, or sweet oranges, to the western city of Palermo, so the arancini there were “feminized” in accordance with the word for this rival fruit. The change never occurred in the eastern port of Catania, which deepened the schism by starting to produce a pointier rice ball as Palermo’s remained spherical. 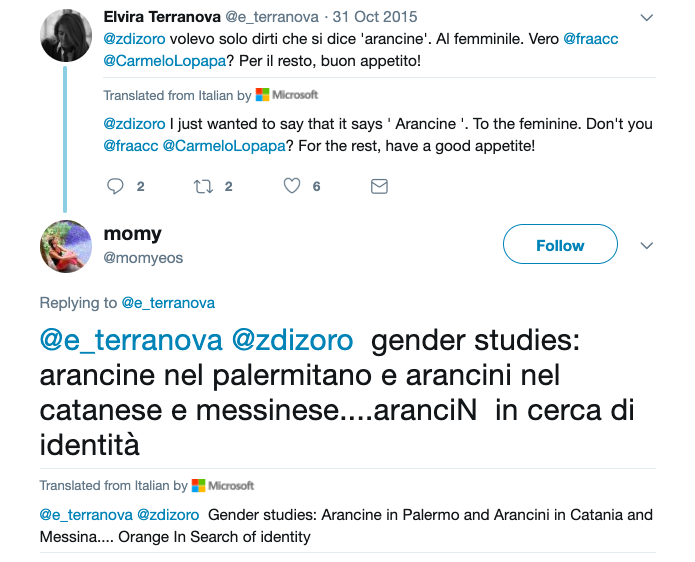 Apparently, using the wrong word variant in the wrong place or context can lead to genuine backlash — and so the great rice ball debate has emerged as the Sicilian flashpoint for a problem that plagues all the gendered romance languages: How the hell does one decide whether a fundamentally genderless object is masculine or feminine (or a different class altogether)? These struggles are bound to last a long time, but can the narrower case of the rice ball be resolved here and now? I’ll admit I learned to call them “arancini,” despite never having the chance to sample the pointed kind that bear the masculine name. And, as MEL editor-in-chief Josh Schollmeyer noted, we are ultimately talking about balls here. (We seem to talk a lot about balls here.) Maybe, though, the rounder versions are more suggestive of feminine curvature, while the elongated versions are phallic — then again, when you open either, they take on a bit of a vaginal quality. Hmmm! No wonder there are different schools of thought on this. Now if only the Sicilians could abandon their petty drama and settle on a word that captured all that: a cute, unclassifiable, orange-resembling gift to your taste buds.